Ripe Japanese ume plums, salted and stewed down with shisho leaves. That’s all this is but I can’t really imagine a substitute and despite eating it semi-regularly, I still struggle to describe it. It’s pickled, so its flavour is concentrated, briney and sweet–and overwhelming in large amounts, in my opinion. But it seems not everyone thinks so, since I’ve read that in they’re often eaten for breakfast in their whole, pickled form. Wow. That would definitely wake me up. The whole umeboshi are also sometimes added to the bottom of a glass of shōchū, which is more up my alley. I’ve found the perfect place for umeboshi in a new recipe that I’ll share with you in a few days. But in the meantime, I highly recommend spreading a little of the paste onto toasted nori, topping it with shaved beets, carrots, sliced avocado, crunchy sprouts and a drop or two of balsamic vinegar. Talk about the whole being greater than the sum of its parts. Looking forward to your recipe! I’ve never had umeboshi, although I’ve had salty plum sodas in Vietnamese restaurants. I’m thinking it could be good as/in salad dressings or as a sauce for what I’m not sure—but I know you will come up with something amazing! i think it would great in salad dressings, ellen. the recipe i have coming up is very, very simple though. 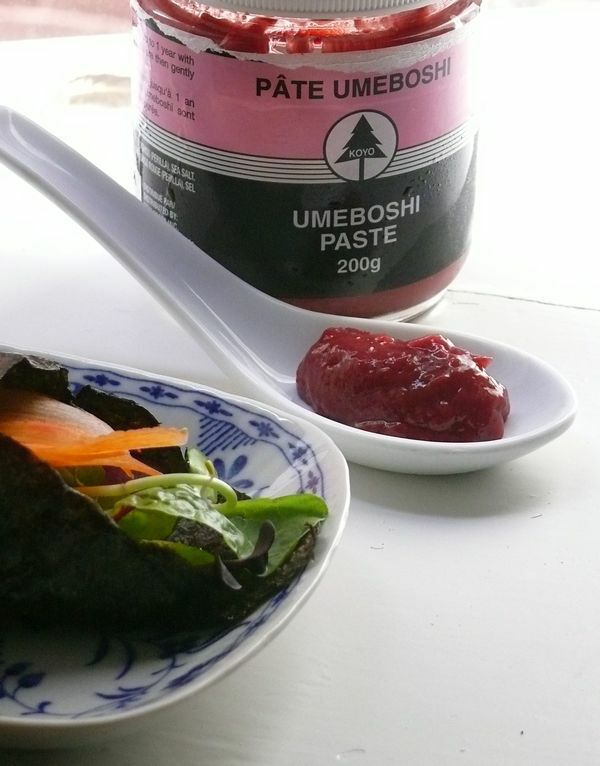 it lets umeboshi paste stand on its own, you could hardly say i was cooking with it.